…….plays with spectacular tonal qualities. …….is designed with a playing facility that makes the instrument a true functional asset to the player. …….has a patina or overall aesthetic beauty makes the instrument desirable from a visual standpoint. Regardless of the level of importance the owner of an instrument places on the aesthetics of an instrument, normal maintenance should include regular cleaning and polishing. This article concerns itself with the topic of general maintenance and the dynamics of cleaning and polishing an instrument including the age‑old art of French polishing. 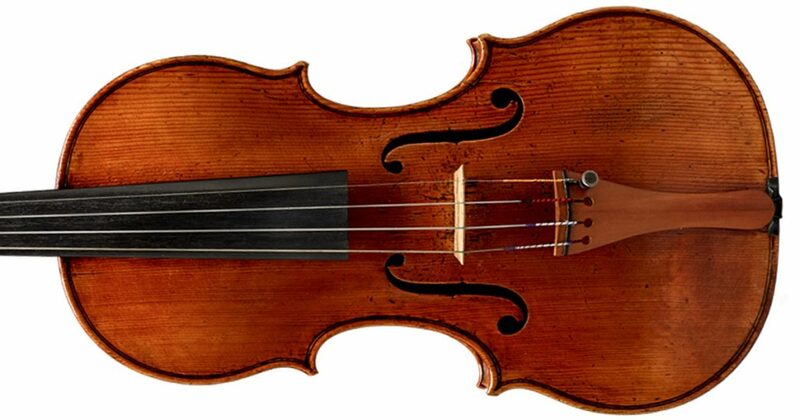 The process of cleaning and maintaining any string instrument be a losing battle at times. However, if you are diligent and wipe the instrument down after use to remove rosin from the top, you can keep your instrument in a nice aesthetic condition with a minimum amount of commitment. There is a selection of fine violin polishes made expressly for use on stringed instruments. What should never to be used on your instrument is a commercial furniture polishes which usually contains wax of the carnauba type and often silicon. This type of polish is totally incompatible with good violin varnish and in the long run, will have negative cosmetic effect on the varnish of the instrument. 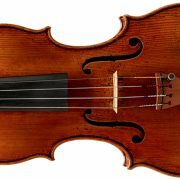 In some instances, very serious damage can occur to the original varnish that could result in major cosmetic restorative costs and possible depreciation and value of an instrument. A good polish that is acceptable for use on an instrument should be composed of basically all essential oils without any form of wax or silicon in the formula. Once applied, a quality polish will not only restore the original quality of a fine varnish and in most cases, inhibit rosin from sticking to the finish. Negligence can be a culprit, for example, when rosin builds up on the instrument and it is left for an extended period of time, the rosin often becomes embedded within the varnish. This is due to the fact that rosin and varnish are of a most similar composition (natural tree resins) and after a period of time rosin sitting on the varnish of the instrument can become bonded to the varnish. In extreme cases of rosin being embedded in fine varnish, even the best of instrument cleaners will not accomplish the removal of the rosin from the surface of the instrument. Often, this damage will result in the fine wet papering of the affected instruments, whereby an extremely fine grit wet/dry sand paper is utilized to physically remove the embedded rosin. In the hands of an expert, this method is quite successful, but it does result in the dulling of the varnish finish. This will entail a required full French polishing to restore the original patina or fine look of the varnish. French polishing, also known as pad varnishing or pad polishing, is an age old technique utilized by fine makers and restorers of furniture and luthiers. In expert hands this process will literally not add nor remove any varnish to and from the instrument. Through the use of a spirit or turpenial based formula applied with a cotton wadded pad, the upper layer of the varnish is softened. I can only over emphasize the importance that this process only be attempted by an experience restorer, as it is a most treacherous method of polishing, which can either result in an instrument’s finish or patina being restored to a level of high quality, or turning in a literal nightmare for the owner and the instrument.. It must be noted that prior to the actual process of French polishing, the severe rosin build up on the bass must be removed (by using the mentioned high grit wet sand paper). This process will remove the rosin but leave the finish in an excellent preparatory stage for French polishing. I cannot over emphasize two things concerning French polishing and cleaning. Firstly, that French polishing is meant to be only accomplished by a competent repair person, and secondly, that the use of alcohol or caustic solvents like xylene, toluene and others can be not only detrimental to one’s health, but like playing Russian Roulette with a loaded gun and that gun (or solvent) is a potential accident waiting to happen. One last point concerning French polishing reminds us that it is a process to be done periodically to enhance the patina of any instrument, but is not a process to be done with any frequency. If a instrument is French polished once a year this is more often then the average. A good musical instrument polish will accomplish the maintenance of the varnish at a small nominal cost. The question often arises whether cosmetic maintenance really has an importance to the tonal or playing qualities of an instrument. Initially most would say no, that the condition of the varnish is really superficial and more aesthetic than anything else. I would in general lean towards this train of though. However, in my time served as a long standing restorer, I have come across some Basses that have been so grossly neglected that the rosin build‑up on the top of the instrument, as well as the bridge of the bass, is so heavily covered that it actually restricts the top and bridge of the Bass from proper vibration. This is extreme, but I have been involved in the correction of this situation more than I wish to be exposed to it. Such a case of neglect takes a good deal to time to correct and to bring the varnish back to the original or close original condition. This restoration usually results in an hefty restoration charge and bit of a lecture to the negligent owner. This concludes this segment of instrument maintenance. Understand, instrument maintenance is the responsibility of the player if he wishes to optimize the tonal qualities of any instrument and maintain the structural integrity of the instrument as well. Maintenance should be accomplished on an annual basis. In general, an instrument that is improperly maintained whether it be from neglect or from poor quality of repair workmanship, is an instrument that will eventually be a candidate for extensive restoration which commensurate with cost factors as well. Like most things in life “preventive maintenance” by a qualified repair person on any level instrument is the most effective and efficient direction to go to. https://kolstein.com/wp-content/uploads/2017/06/summer.maintenance.article.cover_-1.jpg 630 1200 Barrie https://kolstein.com/wp-content/uploads/2019/03/kollogo4-4.png Barrie2017-06-22 20:04:572017-06-27 19:44:44Summer Maintenance!